When Rourke Farms decided to go organic, it went all in, both in terms of acres and equipment. Over 4,000 acres of cropped land started the transition this year, while another third of that has been put to green manure and the farm’s fleet of tractors, seeders, cultivators and harrows has expanded as owners make the switch from chemicals to mechanical weed control. In particular, the farm’s light tillage equipment became critical for the Minto-area farm while the heavy harrow, a piece of equipment that might hit the field twice a year under conventional agriculture, was hardly used, Don Rourke said. Fields were cultivated twice before seeding, blind weeded with the light harrow before emergence, subjected to additional harrow, cultivator or rotary hoe passes in crop for weed control as needed and potentially deep tilled after harvest. 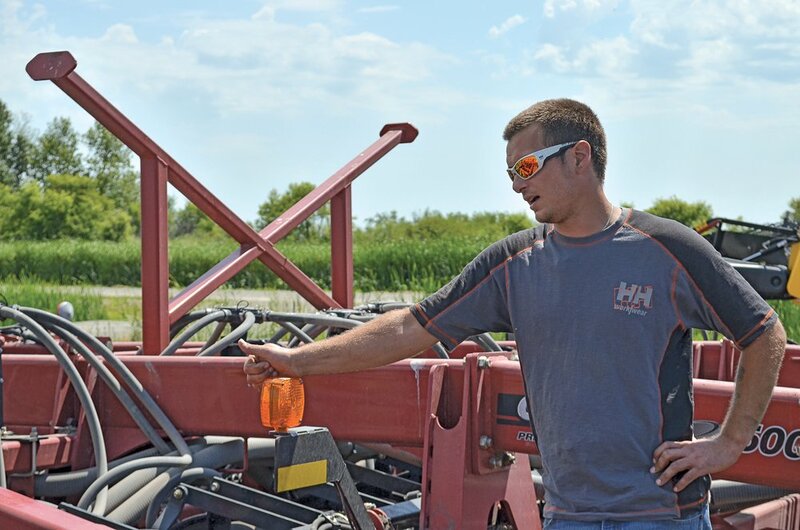 “If I had to buy three things to start out, I would buy a good cultivator, a good harrow — a light harrow for getting weeds before the crop comes up and in crop — and then a disc for plowing down green manures,” Rourke said. Rourke’s interest in organic farming can be tied to father, David Rourke, who has been interested in organic production since attending a seminar on the subject in the ’70s. The farm’s experimental forays into equipment were the centrepiece of their summer field tour, organized by the Manitoba Organic Alliance and Prairie Organic Grain Initiative. The harrow was put to work both for the post-seed blind weeding and in crop in barley at the three- to four-leaf stage with little damage to the crop, Rourke said. He noted, however, that the long harrow dealt less well with ditches, which risked bending the arms. Rourke was less impressed with a 40-foot Yetter rotary hoe, which failed to deal with the clusters of cleaver he was fighting at the time, and a rolling stalk chopper that, while it neatly sliced down a green manure crop in front of the crowd July 28, was prone to damage from rocks. Rourke says he has become a stalwart advocate of rock shields and has adopted S-tines rather than single-shank tines to better deal with stones. One tour member mentioned that the rotary hoe, which received less than stellar reviews from Rourke, worked better on smaller weeds early in the season. Other row-crop cultivators, discs, mobile grain cleaner, a precision disc drill (bought so the farm might pursue more minimal tillage in the future) and seeder were also on display. In several cases, equipment originated from the Rourke Farms shop rather than a machinery manufacturer. Two of the farm’s row-crop cultivators, a 20-foot and 40-foot precision model spaced at 7-1/2 inches, are the Rourkes’ own design. The two camera-guided tillers are built for in-crop weed control, tearing out plants growing between rows while leaving crop largely untouched. While the larger home-build is in the last stage of development, tour attendees saw the smaller of the two at work in a nearby hemp field. David Rourke estimates the home-built 20-foot cultivator cost one-fifth to one-quarter as much as a similar machine would have cost from a dealer. Besides Don Rourke, who counts “heavy-duty mechanic” on his resumé, another farm worker is a formally trained mechanic while David Rourke, himself, has mechanical inclinations. Perhaps ironically, given the added tractor hours necessary in the farm’s current system, David Rourke is a former advocate of zero till and actually based his master’s study on the practice. Now, however, he says he has seen a benefit in rolling back from a strict zero-till system. No-till management has been widely advocated to limit erosion and improve soil health. Despite the learning curve, Rourke Farms has projected roughly the same profit as it made in conventional agriculture through the next two years of its transition, even with one-third of its acres now put to green manure. The younger Rourke expressed concern over potential market flood, however, should a glut of farmers decide to, likewise, transition to organic production.